Some of north Northumberland's best-known landmarks have featured in films and on television. Even villages such as Belford have rubbed shoulders with the most famous Hollywood stars. 'Blackadder - The Complete Collection'. The castles in the area continue to be a major attraction for directors. Alnwick castle was the location for the exterior scenes in the first series of the BBC's Black Adder, starring Rowan Atkinson (1983). A few years earlier, it was used in another BBC production, Count Dracula with Frank Finlay and Louis Jourdan in the title role. The BBC production of 'Count Dracula'. Walt Disney Productions filmed The Spaceman and King Arthur at Alnwick in the 1970s. The story was remade for American television as "A Knight in Camelot" in 1998, this time starring Whoopi Goldberg, and again Alnwick was chosen as the location. The Castle acted as 'Hogwart's School' in the Harry Potter movies. Alnwick castle's water garden has received extensive coverage, including a programme in late 2002 about its opening, featuring gardening expert Charlie Dimmock and HRH Prince Charles. Elizabeth (1998), starring Cate Blanchett and Joseph Fiennes, was shot at Alnwick castle and Bamburgh beach. 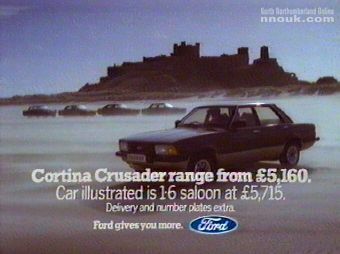 Bamburgh castle has appeared in advertisements, such as this one for Ford cars, and in many TV series' and feature films. Richard Burton came to Bamburgh to shoot scenes on the beach for Becket (1964) and brought Elizabeth Taylor with him. This documentary gives a fascinating glimpse as the crew shoots on the beach in July 1963. It was made by Newcastle and District Amateur Cinematographers Association on standard 8mm film. They viewed the film 'rushes' in the ballroom of the old coaching inn in Belford and visited local pub The Salmon, which still displays a photograph on the wall today. Roman Polanski filmed a violent and bloody version of Macbeth (1971) at Bamburgh. Some five years earlier, Holy Island and Lindisfarne castle provided the location for Polanski's Cul-de-Sac (1966). The film stars Donald Pleasance and Lionel Stander, who is perhaps better known as Max in the TV series Hart To Hart. 'Cul De Sac': now digitally remastered. Instead of staying in a hotel, Polanski chose to live in an old caravan that was invested with earwigs. Not surprisingly, he hated the experience. It isn't know what the Islanders thought of the Hollywood film-makers. But Roman Polanski didn't do himself any favours years later when, in the BBC series HollywoodUK (1993), he recalled his time on the Island, impersonated the local accent and poked fun at the chilly weather (some mistake surely?). However, as he has been a fugitive from justice since the 1970's, it seems he won't be returning to the Island, or indeed the UK, any time soon. Lindisfarne castle also appears in the finale of the TV movie The Scarlet Pimpernel (1983) starring Anthony Andrews. The sequence begins with an atmospheric shot of a horse-drawn carriage crossing the causeway. Highway, ITV's religious programme, has been televised from Holy Island and Bamburgh. In his TV series More Rhodes Around Britain, chef Gary Rhodes cooked in the kitchen at Bamburgh Castle and the Two Fat Ladies visited in 1999. In 2001, excavations and many interesting discoveries, at Holy Island and Bamburgh, were featured in two Channel 4 Time Team programmes. The Farne Islands have appeared in several programmes, often about the wildlife there. These include a live broadcast of BBC Bristol's Birdwatch and items on its Really Wild Show. Simon King reported live from the Farne Islands in the third week of the 2005 series of the BBC's popular Springwatch. The departure of the last keeper on the Longstone Lighthouse was covered in a BBC daytime special. In April 1994 (following contact from the author of this website), BBC Countryfile arrived in Belford to film a report about the deteriorating electricity supply in the area. Their film report was broadcast twice on national BBC Television (on 10th & 13th April 1994). The programme suggested some avenues to explore, including the Department of Trade and Industry (DTI). Matters improved somewhat afterwards. But then around six years later a campaign was launched in Belford to have the electricity infrastructure in the area upgraded further and the DTI was approached. As a result of Countryfile and the subsequent campaign, Belford and other local villages now enjoy a much better electricity supply. We have some behind-the-scenes video of the BBC filming in Belford, which will appear here on our website in the future. In April 2000 there was widespread coverage of the the closure of Barclays Bank in Belford. The closure featured on the national news and on the web on BBC Online — which used pictures from North Northumberland Online. Bamburgh Castle appears in the first episode of the TV series Robin of Sherwood. If you see these scenes, watch out for the drainpipes on the Castle and a white car in the far distance! The 1972 film Mary Queen of Scots, starring Glenda Jackson, includes scenes filmed at Alnwick Castle and Bamburgh. But can those possibly be World War 2 era concrete anti-tank blocks that are visible briefly in the background of one of the shots on the beach? And the distinctive red and white Longstone Lighthouse (not built until 1826 — more than 250 years later) can be seen on the horizon as Mary comes ashore across the dunes in 'Scotland'. But somehow the film-makers manage to disguise the white lighthouse on Inner Farne, which appears in the background of some shots and a sailing ship can be seen in the distance. Both were probably special effects created using a glass painting in front of the camera.